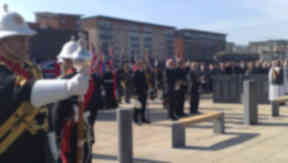 Service is held to unveil a memorial to those who manned submarines based in Dundee during the Second World War. A memorial commemorating the wartime submariners who operated from the River Tay has been unveiled at Victoria Dock in Dundee Harbour. The new memorial, unveiled at a ceremony on Thursday, is dedicated to the six British, Dutch, Norwegian and Russian submarines lost while on patrol from Dundee. From 1940 to 1946 Dundee was the home port of the Royal Navy's 9th Submarine Flotilla - a unique international force composed of British units along with Free French, Dutch, Norwegian and Polish crews after the countries had been overrun by the Nazis. Russian submarine crews were also based in Dundee in the summer of 1944. The Dundee submarines played a role in some of the most daring naval operations of the war. Patrols were maintained perilously close to the enemy-held coastline and enemy warships were attacked, one Dundee submarine heavily damaging the battlecruiser Gneisenau and another blowing the stern off the cruiser Prinz Eugen. The fleet also patrolled far inside the Arctic Circle to protect convoys carrying war supplies to the Soviet Union, on occasion even dicing with the mighty German battleship Tirpitz. One submarine, the O 22, slipped its moors a few minutes after this photo was taken on the afternoon of November 5 1940. Its crew of 42 Dutch and British men, sent to relieve the British submarine HMS Sturgeon on patrol off south-west Norway, were never heard from again. The mystery of the submarine's disappearance was only solved in 1993 when a Norwegian survey vessel stumbled upon its wreck 40 miles off the Norwegian port of Egersund. It is thought she struck an enemy mine three days after leaving Dundee. Historian Dr Andrew Jeffrey, a member of the Dundee Submarine Memorial project, said: "The submarines from here were working well into the Arctic, guarding convoys going to Russia, landing saboteurs in Norway and going to the North Atlantic to intercept U-boats. "It has been a marvellous day here with veterans and ambassadors representing their countries." Commander Timothy Henry, the commanding officer of HMS Portland, currently docked in Dundee, added: "This is an important day for the Royal Navy and for all the nations who are represented here. "I have sailors onboard my ship who are 16, 17, 18 and 19, and this brings home the sacrifice of those that have gone to sea before them to protect their country. "These men were the elite of what they did - they were at the forefront. They performed amazing feats of navigation, seamanship and warfare."